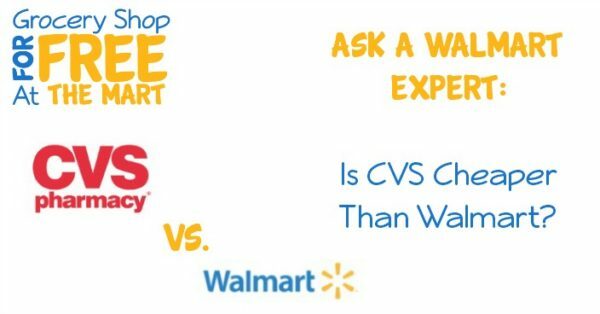 Ask a Walmart Expert: Is CVS Cheaper Than Walmart? Is CVS Cheaper Than Walmart? On most products, not really. Most weeks, CVS has about 10-15 items in their ad that are cheaper than Walmart but almost all of these can be price matched so it’s not worth going to CVS if you are already heading to Walmart. This is usually true of the occasional “loss-leader” like cereal, coffee, or soft drink 2-Liters that are on sale for a lot cheaper than Walmart. The place where you can often find a better deal at CVS is on a product (usually a Health & Beauty Aid product like heartburn medicine or L’Oreal makeup) that has a large ECB attached to it. ECB’s are coupons good for an amount off your next purchase at CVS. Since Walmart doesn’t price match ECB’s you can often find a better deal on those few products at CVS but 90% of the time you are better off using my CVS Price Match List and just heading to Walmart to get everything you need in one place.